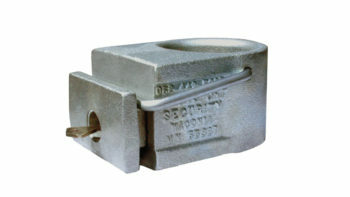 The lock box is heavy gage high carbon steel. 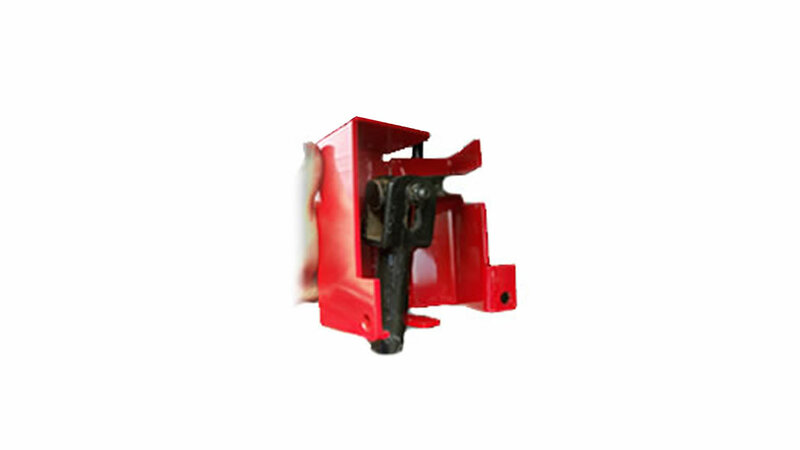 It is easily installed and padlocked over any trailer’s gear handle, preventing the rotation necessary to raise or lower the landing gear. 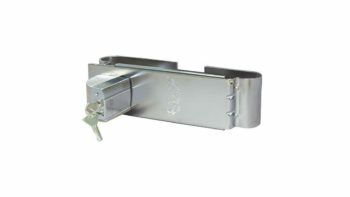 Portable, Easy To Install Lock Box Keeps The Landing Gear Handle From Rotating. Statistics show thieves want to hook up and be gone as fast as possible. The ENFORCER® Landing Gear Lock is designed to make any thoughts of quick and easy removal a waste of time and send them on their way. The padlock included in the kit is our best high security ABLOY® Model 341/25, chrome plated, case hardened steel, rotating disc, virtually pick proof design. For Large Order Discounts, or Shipping Outside of U.S. or Canada, Please Call Customer Service at 305-418-7617. The solid steel alloy casting coupled with the ABLOY® high security locking cylinder make the ENFORCER® king pin lock not something thieves want to see installed. Made of 10 gauge chrome plated spring steel, 1/2″ adjustable locking increments secure around the locking rods for a light fit on all trailers and containers. Launched in 1996, Sealock Security Systems, Inc. is a leader in creating industry-best tamper-evident container security technology. Sealock's unique hybrid devices became the first container seals to be declared a valid anti-terrorist technology by the Department of Homeland Security. Today, they continue to set the international standard for container security solutions that protect cargo, prevent break-ins, and improve supply chain integrity.